SAP chart of accounts contains a list of G/L accounts to record activities of an organisation. It is required to first define respective account groups and then define G/L account master data at the chart of accounts level. Once the G/L account is created at the chart of accounts level, it can be extended to a company code level, hence we will have two SAP G/L account segments for G/L (General Ledger) master data. 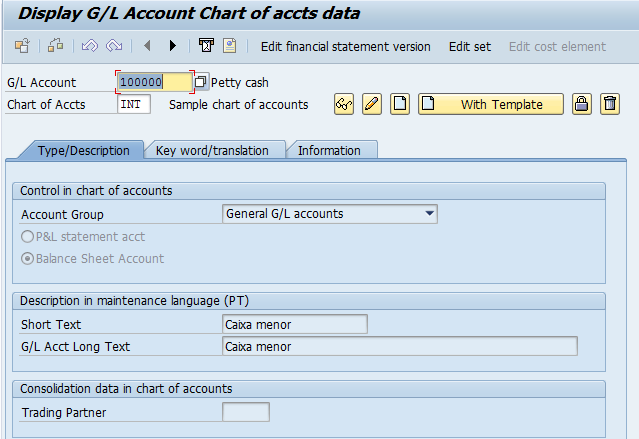 This segment is related to creation of G/L account master data at the chart of accounts level. G/L account master data initially must be defined at the chart of accounts segment level. It has to defined as a profit and loss or a balance sheet account. 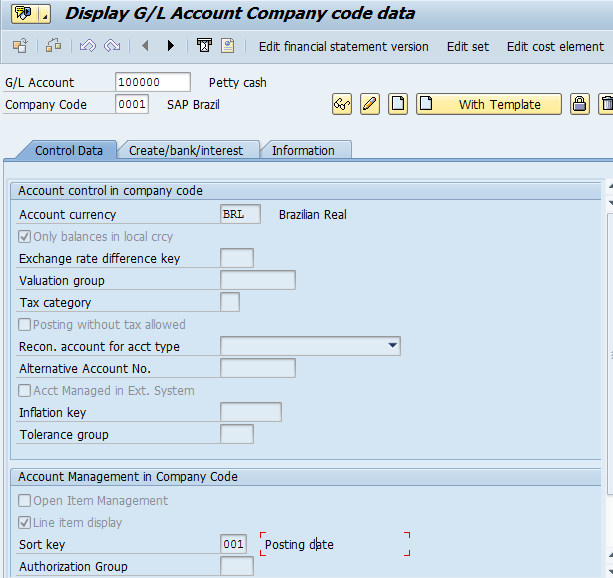 In the SAP chart of accounts segment, we have three tabs of G/L account master data as described below. It contains account group, selection of profit and loss or balance sheet type, selection of retained earnings account (not required for profit and loss accounts, if only one retained earning account maintained at the chart of accounts level), short and long texts, and a trading partner (company). This tab is used to maintain G/L account description at different languages. This tab contains information about G/L account master data creation date, created by, and change documents at the chart of accounts level. It is possible to block or delete G/L account at the chart of accounts level, if no postings have been made yet. This segment is related to creation of G/L account master data at the company code level. First, G/L account has to be defined at the chart of accounts level and then only it is possible to extend or create it at the company code level. In the company code segment, we also have three tabs of G/L account master data as described below. Account currency: By default, it is company code currency but it is also possible to define with other currency. Only balances in local currency: To update balances only in local currency when users post transactions. Exchange rate difference key: To be maintained to fetch foreign currency valuation G/L accounts at the time of valuation. Tax category: To allow tax postings a tax category has to be maintained. Tax postings are not allowed without a tax category. Postings without tax allowed: It is possible to post a transaction without a tax code. Recon. 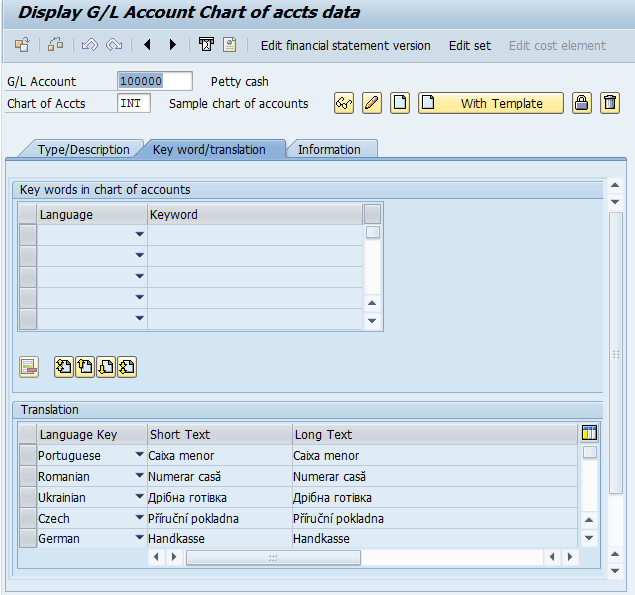 Account for acct type: To define a reconciliation account type asset, vendor, customer or contract account receivable. Open item management: For balance sheet accounts, if the clearing is needed, then this checkbox is needed. Line item display: Selected by default. If selected, it activates line item display. Clearing specific to ledger group: Clearing can be performed at the ledger level. By selecting this checkbox open items and line items will be activated automatically. Sort key: Sort sequence while displaying line items in reports. Field status group: To maintain field status as required/optional/suppress while booking transactions. Post automatically only: To avoid manual postings. Recon. Acct ready for input: To allow alternative reconciliation account functionality and change the reconciliation account while posting. Created on: Date when G/L account was created at the company code level. Created by: User who created the G/L account. Chart of accounts: Chart of accounts where G/L account was created. Country chart of accounts: Assigned to the company code level. Country key: Assigned to the company code. Controlling area: Assigned to the controlling area. Change documents: G/L account master data changes at the company code level. 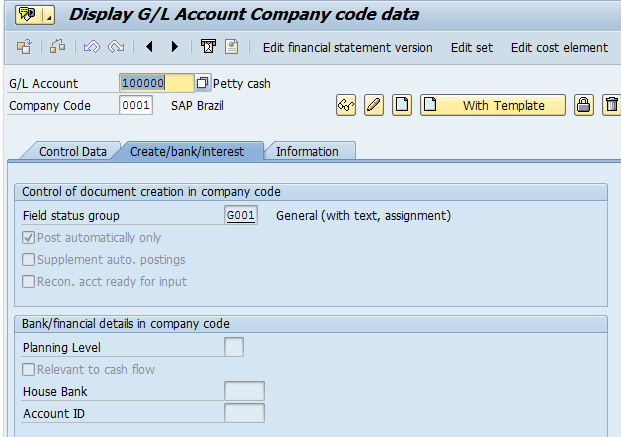 Here you will find screenshots illustrating the process of maintaining SAP G/L account segments for a G/L account 100000 (corresponding to petty cash).